The Crusader mobile mains unit with USB is a mobile mains unit that can be used while away in your caravan, whilst camping or for outdoor use. 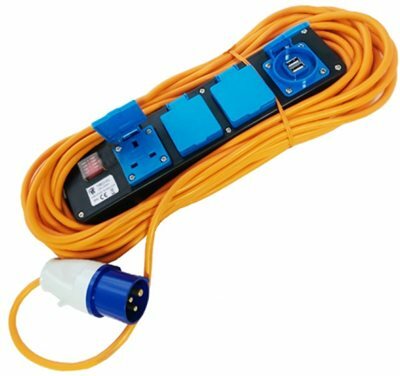 The unit has 15M orange cable, has 3 x 16 amp sockets and 2 USB socket for modern day devices. *Please note some of the packaging has been labled incorrectly and states 4 UK sockets. You will receive 3 UK sockets and 2 USBs as described in the description. This plug is just what we needed for camping and the fact we got a free adapter with it was great as we got to test it out at home. My only issue is the caps that cover the lids, they would be better if they were attatched via a long bit of flexible plastic (IYKWIM) rather than a fixed hinge so they could hang out of the way of larger plugs like the one for my air pump. Will have to remove the cap all together if poss to plug it in safely. The USB sockets are a great feature allowing my kids to charge their tablets whilst leaving room for essentials to be plugged in. Not used it yet, but it's designed better than the other one i had,plus it has USB sockets, good price and delivery.